Want to be a presenter at the 2019 conference? Have a 60-minute presentation great idea that other teachers need to hear! Thank you for your interest in presenting at The Sycamore Gifted Conference. We invite you to share a presentation, conversation, or hands-on activity that pertains to gifted education in independent schools. Close to the Summit's VIP party venue and an easy drive to Sycamore. Located in the heart of Carmel, near the Carmel Arts & Design District, Clay Terrace, and the Center for the Performing Arts. Enjoy the Fairfield's large rooms featuring plush bedding, ample workspaces, and convenient mini-refrigerators. Free perks such as a fitness center and pool, free breakfast to fuel up, and free high-speed internet. 98% of guests recommend this hotel! 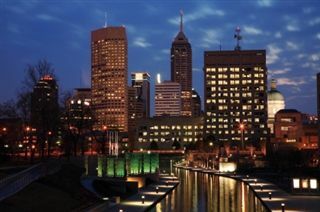 Indianapolis International Airport is easily accessible to downtown and Sycamore School. Fly into Indy and use GO Express and be downtown in less than 30 minutes for just $10! Dr. Joy Lawson Davis is an educator with over 30 years of experience as a practitioner, scholar, author and consultant. In addition to local district and university experiences, Davis served for five years as the Virginia State Specialist for K-12 Gifted services. A graduate of the College of William & Mary Dr. Davis holds both master’s and doctorate degrees in Gifted Education. Davis has served as a keynote speaker and distinguished guest lecturer across the nation, in South Africa and the Caribbean. Diversity Education and Gifted Education are her areas of special expertise. Michael Postma is a consultant, speaker, and author dedicated to the holistic development of both gifted and twice-exceptional children through his company Agility Educational Solutions. Over the last two decades, Dr. Postma has worked in the field of gifted/talented education as both a teacher and administrator in the public school system and was the architect of the Minnetonka Navigator Program (MN), a magnet school for highly and profoundly gifted students. He was also the Executive Director at Metrolina Regional Scholars Academy, a charter school for gifted children in Charlotte, NC. Dr. Postma has multiple degrees. He obtained a B.A. in History from McMaster University in Hamilton, Ontario, Canada, a M.A. in Gifted and Talented Education, and, a Ed. D. in Educational Leadership (Critical Pedagogy) from the University of St. Thomas in St. Paul, MN. He currently lives in Surf City, NC and is the father of four children, three of whom are twice-exceptional.